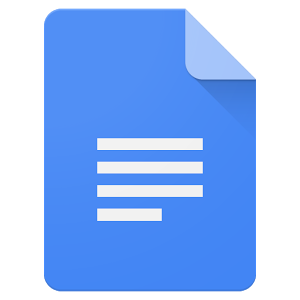 While not as fully featured as Microsoft Word, the Google Docs Android app is good for quick and easy document editing, if you use the Docs cloud storage. Google's adding one feature in the version 1.6.442.22: GIF insertion into documents. Sadly, this doesn't seem to be live in the Docs update that was released yesterday. These GIFS are added through Google Keyboard - go to add an emoji, then tap GIF. 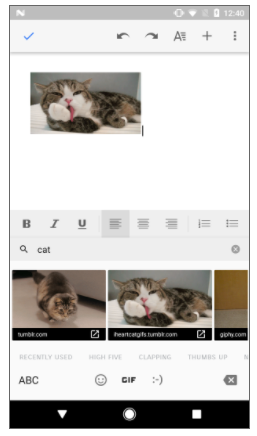 GIFs will be searchable, much like in other apps, and then can be added to a document. The only picture we have of the feature at the moment is below. Sadly, this isn't a GIF. But it's a got two cats in it, so it's all good. As we don't have the APK yet, there's nothing more really to say at this point. Once it hits APK Mirror - or is rolled out via a server-side update - we'll let you know. If you are seeing this feature in your Docs app, let us know in the comments. Until then, the latest Docs update, from November 29, is available on Google Play, or APK Mirror. An APK with the GIF insertion feature has shown up on APK Mirror, version number 1.6.462.12. The feature works much as you'd expect - add a GIF through Google Keyboard and it will insert into the document. To avoid the Play Store's staged rollout, you can get it at APK Mirror.